Due to the success of the Coachmenomic Stimulus promotion, consumers in the market for a new Coachmen RV Group product now have until September 30, 2008 to take advantage of these generous rebates. Part of the success of Coachmenomics is that it is easy. Consumers simply download a Coachmenomics rebate coupon directly from the internet at www.coachmenrv.com/voteforpete, take the coupon to a Coachmenomics participating Coachmen RV Group dealer and work their best deal on a qualifying new Coachmen RV Group product. "The response to the Coachmenomic Stimulus promotion from our dealers and customers has been fantastic. 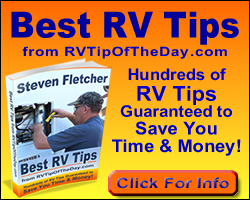 This promotion has made it even more affordable for our customers to enjoy the RV lifestyle." said Mike Bear, Executive Vice President of Coachmen RV Group. "We believe consumers have embraced this rebate promotion because it allows them to determine how they spend the money. Rather than giving the consumer a gas card that can only be used for fuel, they can take the money in the form of a rebate and use it any way they wish; or they can apply the rebate to their down payment for their new RV." The rebates Coachmen is offering range from $250 on the very economically priced 2009 Spirit of America® travel trailer up to $2,000 on a 2009 Sportscoach® Class A diesel coach. And, the Coachmenomic rebates are multiplied on new 2007 and 2008 model year products of select models in dealers' inventory. So for instance, the rebate would be $5,000 for a 2008 Sportscoach motorhome and $1,500 for a 2008 fifth wheel. The rebate program applies to select new products marketed by Coachmen RV Group under the brand names Coachmen®, Sportscoach®, Georgie Boy™, Adrenaline™ and Viking®.